"A-Series": A-1200, A-12-A, A-1300, A-1400 and A-1500 4-Cyl. INSTALLATION NOTE: When installing a new set of rockers, we strongly recommend that a NEW rocker shaft and NEW adjuster screws be installed to insure proper tolerances and to reduce premature wear. 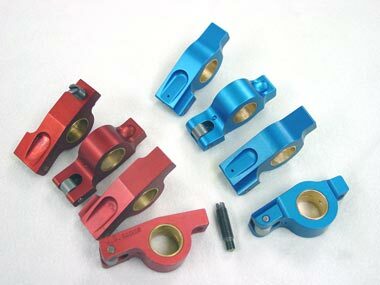 Our custom lifters for Nissan/Datsun A & R Series are designed for competition engine application. These lifters have an enlarged diameter head to assist in maintaining adequate and proper camshaft lobe contact necessary when aggressive racing cams are being used. They are also slightly lighter in weight than the OEM lifters which is critical to maintaining the valve train integrity in these hi-revving engines. JBR Competition lifters weigh only 57.0 grams each. Stock Nissan/Datsun camshaft lifters weigh 62.5 grams. These lifters are fabricated from special Tool Steel and heat treated for durability. Lifters have large diameter mushroom heads designed for use with modern high lift/long duration racing camshafts.